Maybe the most influental musician of the last 20 years. If you ask anybody on the street they will know, they already heard that name. He is an ideal of youngs and oldest, an icon, a brand. Or just a lucky guy with an extremely adventurous life, who "lost" in the 90's rock n' roll waves, surviving to be on tour with Guns n' Roses for years and to meet and work with Axl Rose.. He is best known as the former lead guitarist of the American hard rock band Guns N' Roses, with whom he achieved worldwide success in the late 1980s and early 1990s. During his later years with Guns N' Roses, Slash formed the side project Slash's Snakepit. He then co-founded the supergroup Velvet Revolver, which re-established him as a mainstream performer in the mid to late 2000s. 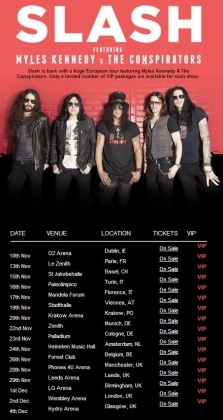 Slash has since released three solo albums, Slash (2010), featuring an all-star roster of guest musicians, Apocalyptic Love (2012) & World on Fire (2014) recorded with singer/guitarist Myles Kennedy of Alter Bridge, along with rhythm section Brent Fitz and Todd Kerns, known on the album as The Conspirators. ... and now he is back in Europe, heading to Austria.